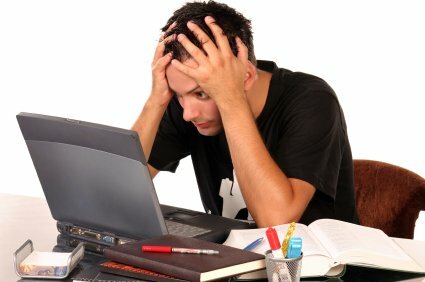 All students have to deal with stress on some level in their lives. Some teenagers are stressed about school and their academics. Others are stressed because of their families or their social life. Most of these students know how to deal with their stress and think that it is just a part of life. There are many stressors in life. For most teens, school is the biggest stress in their lives. They have due dates, big projects, homework, and normally do not have enough time for all of it. For John Haff, a junior at Granite Bay, homework is the biggest stress in his life. Many students have the same opinion and say that school is a huge stressor. Another big stress is relationships and friends. Arguments and tension in any relationship can cause someone a lot of strain. This can make them act in ways that they normally wouldn’t, such as yelling, cursing, being unable to make rational conclusions, and leaving abruptly. One Granite Bay student says that his parents “stress [him] out because they don’t understand” how much work he has to do for school. Relationships for teenagers can be very difficult and upsetting. Expectations from family members, teachers, and friends can also be a huge stressor in a teenager’s life. Most students are pounded with the expectations to be the perfect student, son or daughter, or the “best of friends”. Some students say that they have to do their best with a certain sport because they think people expect them to do well. This also goes for academics. Junior, Jeannette Ilyev, says that she has “a lot of weight on [her] shoulders to do well” in her IB classes to get into the college she wants. But there are ways to deal with one’s stress. Time is a huge stressor, so taking naps and being proactive helps with stress. Also, allowing a lot of time and energy for a certain project or assignment will help. If a student gets too stressed, they can take a break from what they are working on and maybe self reflect on what they are doing or just their daily life. There are also ways to cope with relationship stress. Talking and expressing each other’s feelings helps because you do not keep things bottled up inside. Another stress reliever is giving each other space and maybe hanging out with friends. For Granite Bay students, there are certain things that they like to do to lessen stress. Many students listen to music, exercise, and hang out with their friends. For Joey Long, a Granite Bay student, making lists and schedules reduces opportunities for him to be stressed because he “always knows what and when he needs to get things done”. The best stress reliever for anyone is being positive and looking on the bright side of everything. There is always enough time and the world is not going to end if you turn in your assignment a few days late. High school is supposed to be a fun and exciting experience that everyone should enjoy. Stress should not make someone’s high school life dreadful and unwanted. So next time you get anxious and/or stressed, take a deep breath and chill out. Great article! I’ve bookmarked it for when my 3 kids become teenagers. I also saw Michelle’s editor profile and articles at grrronicle.com. I’m sure you’re very proud of her! customer interactions, in addition to all the correct information being inputted. the death and disablement of an insured due to an accident. getting frustrated that all the work could be wasted. or Shani – BPO as backup. news, health related news and others. Forex trading and the market as a whole is greatly influenced by US dollar. Industry but not much in limelight. Any way I will be subscribing for your feeds and even I achievement you get admission to constantly rapidly.